Microwave onions, garlic, oil, tomato paste, porcini mushrooms, and thyme in bowl, stirring occasionally, until onions are softened, about 5 minutes transfer to slow cooker. Stir chicken broth, bacon, carrots, Portobello mushrooms, lentils, and bay leaves into slow cooker. 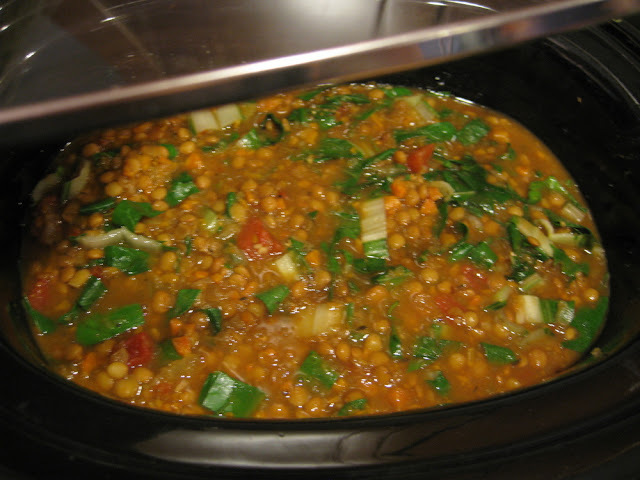 Cover and cook until lentils are tender, 9 to 11 hours on low or 5 to 7 hours on high. Stir in chard, cover, and cook on high until chard is tender, 20 to 30 minutes. Discard bacon and bay leaves. Season with salt and pepper to taste and serve with additional olive oil. End.